The paper from researchers with the Cassini mission, published in the journal Science, indicates hydrogen gas, which could potentially provide a chemical energy source for life, is pouring into the subsurface ocean of Enceladus from hydrothermal activity on the seafloor. The presence of ample hydrogen in the moon’s ocean means that microbes – if any exist there – could use it to obtain energy by combining the hydrogen with carbon dioxide dissolved in the water. This chemical reaction, known as “methanogenesis” because it produces methane as a byproduct, is at the root of the tree of life on Earth, and could even have been critical to the origin of life on our planet. Life as we know it requires three primary ingredients: liquid water; a source of energy for metabolism; and the right chemical ingredients, primarily carbon, hydrogen, nitrogen, oxygen, phosphorus and sulfur. With this finding, Cassini has shown that Enceladus – a small, icy moon a billion miles farther from the sun than Earth – has nearly all of these ingredients for habitability. Cassini has not yet shown phosphorus and sulfur are present in the ocean, but scientists suspect them to be, since the rocky core of Enceladus is thought to be chemically similar to meteorites that contain the two elements. “Confirmation that the chemical energy for life exists within the ocean of a small moon of Saturn is an important milestone in our search for habitable worlds beyond Earth,” said Linda Spilker, Cassini project scientist at NASA’s Jet Propulsion Laboratory in Pasadena, California. The Cassini spacecraft detected the hydrogen in the plume of gas and icy material spraying from Enceladus during its last, and deepest, dive through the plume on Oct. 28, 2015. Cassini also sampled the plume’s composition during flybys earlier in the mission. From these observations scientists have determined that nearly 98 percent of the gas in the plume is water, about 1 percent is hydrogen and the rest is a mixture of other molecules including carbon dioxide, methane and ammonia. The measurement was made using Cassini’s Ion and Neutral Mass Spectrometer (INMS) instrument, which sniffs gases to determine their composition. INMS was designed to sample the upper atmosphere of Saturn’s moon Titan. After Cassini’s surprising discovery of a towering plume of icy spray in 2005, emanating from hot cracks near the south pole, scientists turned its detectors toward the small moon. Cassini wasn’t designed to detect signs of life in the Enceladus plume – indeed, scientists didn’t know the plume existed until after the spacecraft arrived at Saturn. “Although we can’t detect life, we’ve found that there’s a food source there for it. It would be like a candy store for microbes,” said Hunter Waite, lead author of the Cassini study. The new findings are an independent line of evidence that hydrothermal activity is taking place in the Enceladus ocean. Previous results, published in March 2015, suggested hot water is interacting with rock beneath the sea; the new findings support that conclusion and add that the rock appears to be reacting chemically to produce the hydrogen. The paper detailing new Hubble Space Telescope findings, published in The Astrophysical Journal Letters, reports on observations of Europa from 2016 in which a probable plume of material was seen erupting from the moon’s surface at the same location where Hubble saw evidence of a plume in 2014. 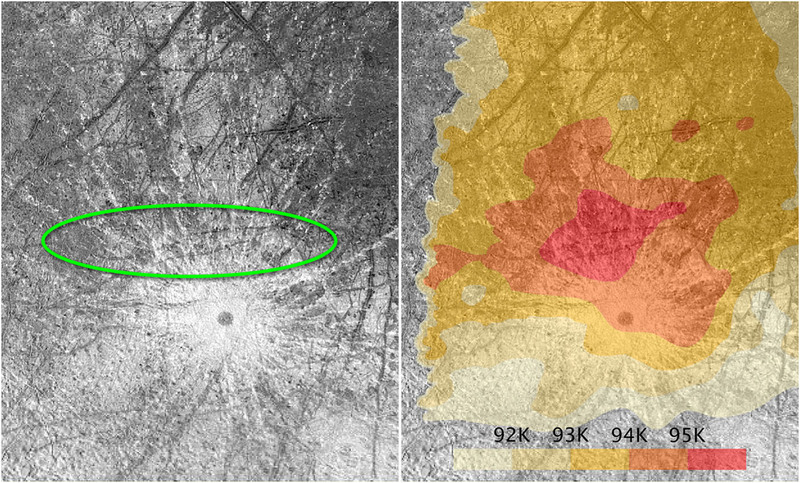 These images bolster evidence that the Europa plumes could be a real phenomenon, flaring up intermittently in the same region on the moon’s surface. 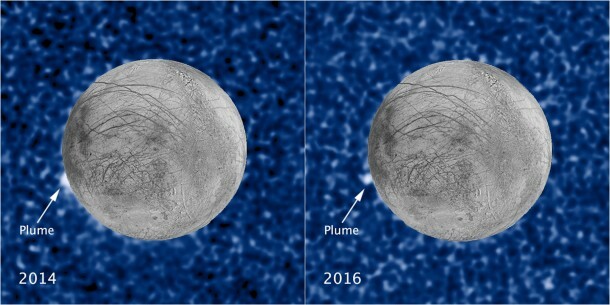 The newly imaged plume rises about 62 miles (100 kilometers) above Europa’s surface, while the one observed in 2014 was estimated to be about 30 miles (50 kilometers) high. Both correspond to the location of an unusually warm region that contains features that appear to be cracks in the moon’s icy crust, seen in the late 1990s by NASA’s Galileo spacecraft. Researchers speculate that, like Enceladus, this could be evidence of water erupting from the moon’s interior. “The plumes on Enceladus are associated with hotter regions, so after Hubble imaged this new plume-like feature on Europa, we looked at that location on the Galileo thermal map. We discovered that Europa’s plume candidate is sitting right on the thermal anomaly,” said William Sparks of the Space Telescope Science Institute in Baltimore. Sparks led the Hubble plume studies in both 2014 and 2016. The researchers say if the plumes and the warm spot are linked, it could mean water being vented from beneath the moon’s icy crust is warming the surrounding surface. Another idea is that water ejected by the plume falls onto the surface as a fine mist, changing the structure of the surface grains and allowing them to retain heat longer than the surrounding landscape. For both the 2014 and 2016 observations, the team used Hubble’s Space Telescope Imaging Spectrograph (STIS) to spot the plumes in ultraviolet light. As Europa passes in front of Jupiter, any atmospheric features around the edge of the moon block some of Jupiter’s light, allowing STIS to see the features in silhouette. 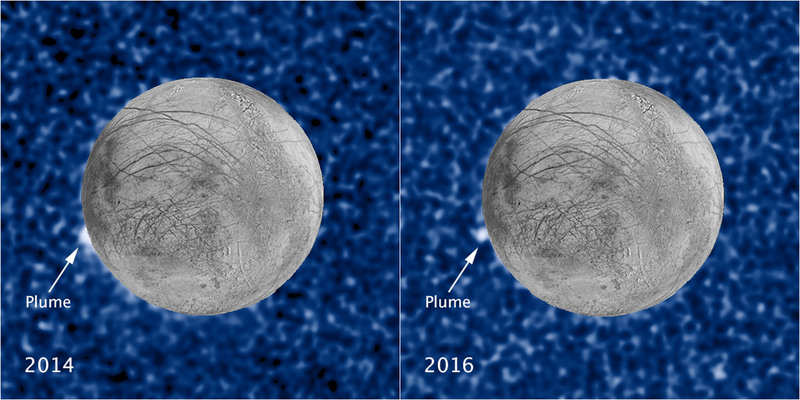 Sparks and his team are continuing to use Hubble to monitor Europa for additional examples of plume candidates and hope to determine the frequency with which they appear. 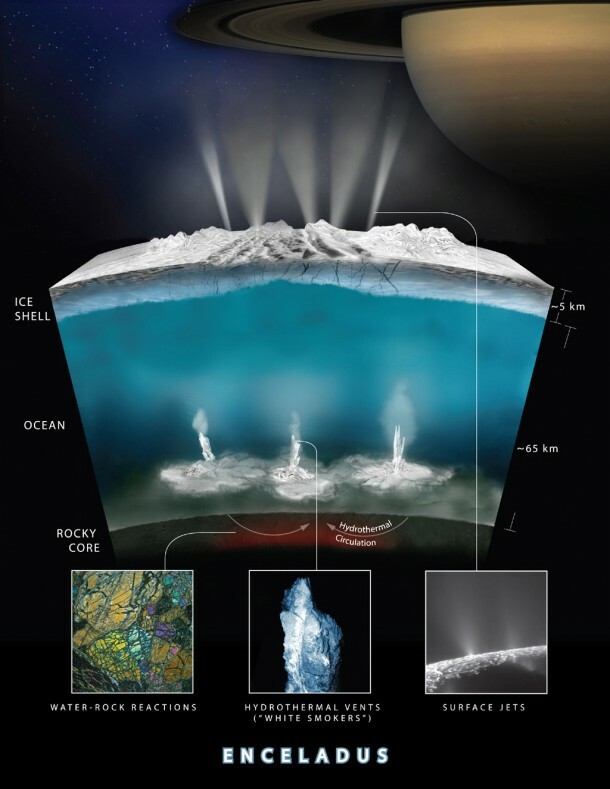 NASA’s future exploration of ocean worlds is enabled by Hubble’s monitoring of Europa’s putative plume activity and Cassini’s long-term investigation of the Enceladus plume. In particular, both investigations are laying the groundwork for NASA’s Europa Clipper mission, which is planned for launch in the 2020s. “If there are plumes on Europa, as we now strongly suspect, with the Europa Clipper we will be ready for them,” said Jim Green, Director of Planetary Science, at NASA Headquarters. Hubble’s identification of a site which appears to have persistent, intermittent plume activity provides a tempting target for the Europa mission to investigate with its powerful suite of science instruments. In addition, some of Sparks’ co-authors on the Hubble Europa studies are preparing a powerful ultraviolet camera to fly on Europa Clipper that will make similar measurements to Hubble’s, but from thousands of times closer. And several members of the Cassini INMS team are developing an exquisitely sensitive, next-generation version of their instrument for flight on Europa Clipper.